As you slowly clamber down the side of the volcano you come across a small cave. Finally, a safe haven away from the heat where you can rest a spell. As you sit down to rest you hear a low, guttural growl. A faint, orange glow emits from far back in the cave. By the time you get up to get a closer look at the source of the glow, you see an enormous bear made of lava charge in your direction. You let out a scream as you are engulfed in flames by the breath of the magma bear. This week I wanted to pick a creature outside of the Monster Manual and opted for using a homebrew resource. 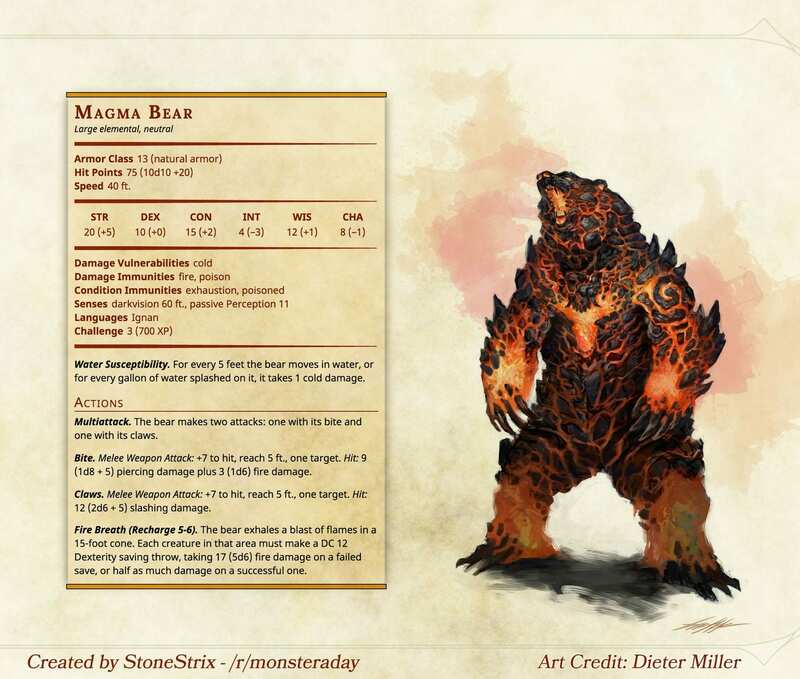 The magma bear from the Monster a Day Compendium is the subject of this week’s Monster Monday. It’s a simple homebrew, but still, a powerful elemental creature that I’ve used a few times with great success. Magma bears make for an engaging and unique encounter. They are tough as nails, but have a couple of glaring weaknesses that a party can exploit. They also deal a large amount of AoE damage with a breath attack that they are immune to. This makes them a deadly pack encounter as they can corner a group and decimate them without taking any damage from another’s attack. One thing that is missing from the magma bear’s page in the MaD Compendium is the lore. Despite the missing lore section, the stat block has a lot of flavor and it’s pretty easy for a DM to make their own lore up for the magma bear. I’ve used magma bears in two separate ways. The first was as pets for an evil way of the four elements monk that my party had to face. Each room contained creatures from a different element and the fire room had a few of the magma bears. I used them just as you would any other guard animal. I’ve then since taken this original idea and expanded upon it. Magma bears are natural creatures found in volcanic regions. The heat of a volcano does not bother them, in fact they love the climate. Due to their immunity to fire damage they use lava for baths and like to roll around in it. They don’t have packs per say, but there is only so much space in a volcano so they are always in close proximity with each other. The magma bear has excellent strength and hit points with decent constitution and speed. The rest of its base stats are pretty mediocre at best. This is a well-balanced stat spread since very few CR 3 creatures will have 20+ strength. It needs the rest of the stat pool to be fairly low to balance this creature out. We can correctly assume that the magma bear will be able to dish out some massive amounts of damage based on its ability to close the gap and extremely high strength score. Outside of its strength score, the magma bear’s real strength is in its resistances and immunities. 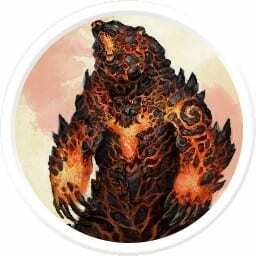 You can tell that the magma bear is a homebrew creature because it actually has a damage vulnerability. Jokes aside, this counteracts the fact that it has multiple damage and condition immunities. It already has a decent constitution score, but the magma bear is immune to exhaustion and poison making it difficult to debuff and CC. It has darkvision, but can easily be sneaked up on with only an 11 Perception. Having immunity to fire damage is a key part of the magma bear’s strengths which we will see later. Fire immunity is also an extremely powerful immunity as I’ve said before since fire is one of the most common damage types. Water Susceptibility. For every 5 feet the bear moves in water, or for every gallon of water splashed on it, it takes 1 cold damage. Having additional ways to harm the magma bear helps keep its multiple immunities and high HP in check. Being able to maneuver the magma bear into a position where it is splashed with water or submerged makes for an interesting encounter. Keep in mind that due to its cold vulnerability it will actually take 2 cold damage! Bite. Melee Weapon Attack: +7 to hit, reach 5 ft., one target. Hit 9(1d8 + 5) piercing damage plus 3 (1d6) fire damage. Claws. Melee Weapon Attack: +7 to hit, reach 5 ft., one target. Hit 12 (2d6 + 5) slashing damage. Fire Breath (Recharge 5-6). The bear exhales a blast of flames in a 15-foot cone. Each creature in that area must make a DC 12 Dexterity saving throw, taking 17 (5d6) fire damage on a failed save, or half as much damage on a successful one. The magma bear has two choices of attack combinations. The first is the standard brown bear Bite & Claws combination with an extra point of damage due to the magma bear’s strength. It also gains an additional 1d6 fire damage from its Bite attack which is nothing to scoff at. This averages out to 25 damage per round with its Multiattack which is pretty solid for a CR 3 creature. Its Fire Breath gives the magma bear a short-ranged AoE attack option when it has a charge available. It deals 17.5 fire damage per creature on average. This is balanced out by its low Dexterity saving throw that a character can make to talk half damage. Despite that, it’s still 8.75 average fire damage per Fire Breath which is nothing to scoff at for a CR 3’s AoE. Despite the magma bear not having any long ranged attacks, it is still a hearty combatant. Its Multiattack combination can deal a large amount of damage to a single enemy. Its average damage of 25 and +7 to hit makes it able to potentially down a caster PC pretty easily if it is in range. If the magma bear is able to hit multiple enemies with its Fire Breath it can deal some pretty significant damage as well. The magma bear has access to two different combat styles and both can deal large amounts of damage. Its design to drop the opponent before they are able to exploit its vulnerability and various weaknesses. Having 40 ft. of movement is extremely useful for a creature like the magma bear. It needs to be within short-range or melee range to deal its damage. 40 ft. of movement will outrun most PCs, especially at the lower levels. Having this extra movement also gives the magma bear some breathing room to reposition into a more favorable spot to use its Fire Breath. The magma bear’s immunity to exhaustion and poison also help to prevent it from being grappled. These are two status effects that give disadvantage on ability checks, meaning that if you do manage to slow it down using a grapple, it will still have a good chance with its +5 strength to break free and keep charging at your back-line. With an AC of only 13, more often than not you’ll be dealing damage to the magma bear. While it does have a large amount of HP, this will not make up for you being able to hit it with ease. If you have a lot of ranged PCs in the party your band of adventurers will be able to constantly hit it and run to avoid it cornering them. Outside of its +2 constitution and +1 wisdom bonuses the magma bear is pretty susceptible to being affected by CC. Any saving throw that requires a Dexterity saving throw will have the magma bear entirely at the mercy of the dice. Its constitution and wisdom, while above average, still make it a viable target to CC abilities. Grappling it will be hard due to its strength, but not impossible. Although I did joke about it earlier, having a vulnerability in D&D 5e is a huge deal. Being able to deal double damage to something can make a difficult fight extremely easy if you find the creature’s weakness. Keep in mind that with its low AC the magma bear will be regularly hit by a lot of these cold attacks. It’s a real problem. Ray of Frost is basically the magma bear’s worst nightmare. First of all, it deals cold damage so it exploits its vulnerability. Secondly, it slows the magma bear to only 30 ft. of movement on a hit allowing the ranged characters to continue to stay out of melee range. Couple this with its low AC and a Sorcerer or Wizard with this cantrip will dominate the magma bear in any fight. Using a couple of magma bears together to corral a group of enemies into a corner is an excellent tactic. This gives the magma bears an opportunity to use their Fire Breath attacks in tandem to obliterate a small group at once. The best part is that due to their immunity to fire damage, the magma bears can hit each other with this breath and not worry about taking collateral damage. This makes it considerably easier to pull of maneuvers like this. Even if their Fire Breath is not up, cornering a group of enemies is still a bonus. Giving your enemy no room to move out of short-range or melee range is key for a magma bear to have a chance against their opponent. If your magma bears are being assaulted by cold damage they need to quell that threat immediately. While their intelligence is extremely low, their wisdom is high enough that they’d be able to tell that this particular enemy is a threat to their survival. If a PC is lobbing Ray of Frosts at one of your magma bears they have become public enemy number one. Charge at them and take care of the threat before it’s too late. I love using the magma bear in my combat encounters. While they don’t have a ton of rich lore they have plenty of flavor and are just plain fun to use. Their immunities and vulnerability make for interesting encounters that can raise the stakes and challenge your party to use new maneuvers to fight off this threat. Go wild and make your own lore up about them. They work great as scenery and wildlife for extremely hot biomes like harsh deserts or volcanoes. I find that they’re also a great way to introduce players to the concept of cone abilities and breath attacks for when they eventually face a dragon in your campaign. This is a new concept for players to understand the geometry of the spells and abilities in D&D 5e, but the magma bear is simple enough and of a low CR that it can be used as a learning tool. If the magma bear interests you, you can find it and other great homebrew creatures in the MaD Compendium which you can grab here! I doubt the staff there would very much like the fact you are using their art without permission! I believe all their content is copyrighted!